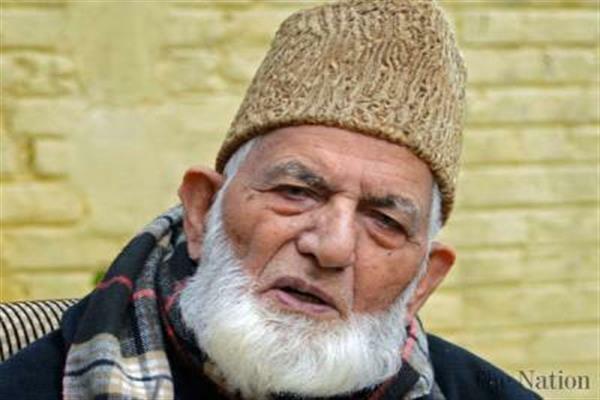 Srinagar: Strongly condemning the rampage and brutalities against Kashmiris and Muslims in Jammu, Hurriyat Conference (G) chairman, Syed Ali Geelani has said that Kashmiris do not rejoice or celebrate the human loss of any race, region or religion—as our “oppressor distributes sweets when dozens of our youth are gunned down by their “brave soldiers”. Hurriyat (G) chairman said that muscular and revengeful response to the Pulwama incident against Muslims of Jammu and Kashmiri employees of darbar move looks a well planned conspiracy to tear away every fiber of communal harmony, social bonding and collective brotherhood. He said that horrifying scenes of ruthlessly beating to pulp of Kashmiri drivers, students, employees, others and burning their vehicles, stoning their residences under the nose of biased police with their encouragement and go ahead signal has once again proved the “two nation theory right”. Hurriyat Conference (G) chairman said that in chaining Kashmiris, every Indian, particularly its political class echoes in one voice.